Over the past few days you've learned what Windows Explorer is, where to find it, and how to tweak its layout. 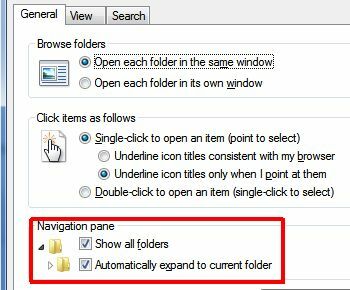 Today, let's look at an option that makes Windows Explorer a little easier to navigate. One of my little gripes with the Windows 7 version of Explorer is that it constantly forces me to manually expand folders and subfolders, instead of just showing me everything up front. I'm sure Microsoft did that to make everything seem less cluttered, but for me it just means extra work. Check the Show all folders and Automatically expand to current folder boxes, then click OK.